Back in 2012, I took a road trip with a friend of mine from Michigan to California and back. It was one of the best trips I've ever taken. 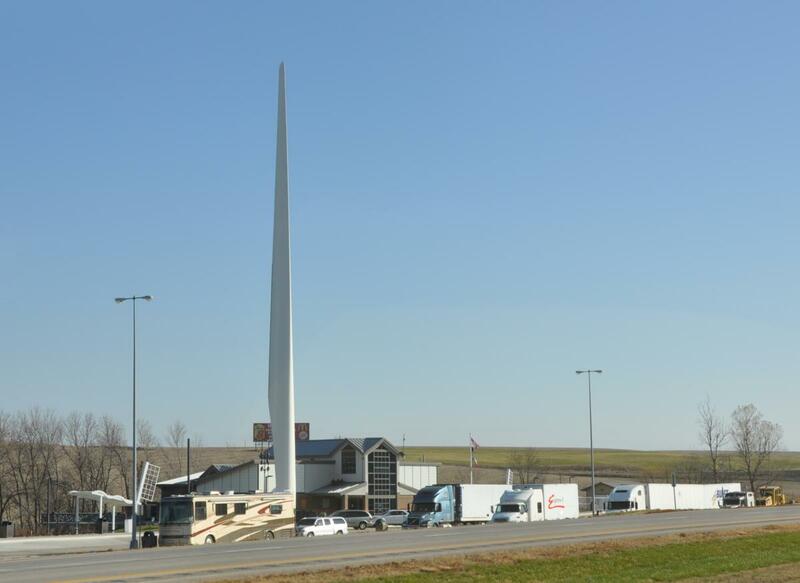 One thing I remember about that trip (and I'm still kicking myself for not getting a picture of it) was a rest area somewhere along I-80 west of Des Moines that had a very tall white tower in front of it that you could see from miles away along I-80 as you're approaching it. (Think of something resembling Washington Monument in D.C.) Does anyone know what I'm referring to? When I first saw it miles away, I was thinking, "What is THAT?" And all it was was a rest area. Anyway, the reason I ask is because I'll be driving to and from the Denver road meet at the end of this month. Sam Scholtens and I are taking I-80 back to Michigan, and I'm hoping to drive by this rest area in the daylight so I can get a good picture of that white tower. Does anyone know exactly where that rest area is? It's just east of the town of Adair, I'd wager a guess of mile marker 80-81, and the "tower" is a wind turbine blade. edit:// unfortunately, all the GSV imagery of the area is from 2011, before the blade was installed. edit2:// and given that I'm currently at home, and the trend of my company having me pick up at General Mills in Galesburg and head to North Platte, NE coming out of hometime...there's a good chance I'll be by there sometime on Monday. If I do swing by, I'll grab a pic. It's not a tower, it is a wind turbine blade. The whole WB rest area near Adair seems to have a windmill/turbine theme. It appears the blade was added after the streetview van went by: link. EDIT: Crazy Volvo Guy beat me to it. Thanks, guys! I didn't realize it was part of a wind turbine - interesting. I'm trying to decide whereabouts I should book a motel room between Omaha and Des Moines, and I might make it west of Adair so I can take a picture of that structure in daylight hours. If you're into wind turbines, drive I-65 in Indiana between Lafayette and Remington sometime. Or any number of highways in the Appalachians of West Virginia or Pennsylvania. That Iowa one is a bit different though. It's a vertical one as opposed to having the fan-style blades. Did that. Would've bought the T-shirt if there were any available. Also US 30 through Van Wert, Ohio, has a nice collection pf wind turbines. It's just one of the blades that was erected in front of the rest area as art. Thank you for posting that picture!!! That's exactly what I was referring to. I had no idea it was part of a wind-turbine theme. Sam Scholtens and I will drive past that in just a few weeks on our way home to Michigan from Denver.